Console development isn't where the money's at anymore, says Disney CEO Bob Iger. Disney is reducing the amount of money it spends on making videogames after losing nearly half a billion dollars over the last two years. Particularly affected will be console development, which Disney plans to scale back in favour of casual and social games. Iger said that Disney had seen a shift in the videogame industry away from consoles, and had decided to go where the money was. He said that Disney's goal was to make its interactive division more profitable by reducing its investment in consoles and instead diversifying - albeit with a smaller spend - into alternate platforms like smart phones and social networks. Iger added that having John Pleasants - the former CEO of Playdom, the casual game publisher that Disney acquired earlier in year - at the head of Disney Interactive would be very important to the division's business going forward. 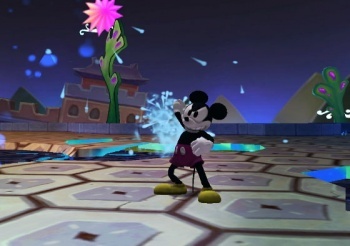 Disney owns a number of console gaming studios, including Black Rock Studio in the UK, which made arcade racer Split/Second, and Warren Spector's Junction Point Studio, which made Epic Mickey. It's not clear exactly where this reduction in console investment will happen, and it will largely depend on where Disney is losing money. If it's the tie-in games it publishes for its TV shows and movies like Hannah Montana or Pirates of the Caribbean, then we can expect to see those franchises transitioning to social networks and cell phones. But if it's the core titles that are underperforming - as the lackluster sales of Split/Second reported by NPD earlier in the year suggests might be the case - then Disney will understandably want to spend it's money elsewhere. We might also see Disney continue to produce the same range of content as it did, but restrict releases to the consoles where the it's likely to have the most success. The tie-in game for Toy Story 3 probably did a brisk trade on the DS and the Wii, but was likely overlooked by most of the PS3 or Xbox 360 audience. If Disney sunk a lot of money into developing for platforms like the Xbox 360 and PS3 - such as the PS3 exclusive content for Toy Story 3 - with very little to show for it, dropping support for those platforms, at least for some of its games, might be a great way for Disney to save money and minimize its losses.